From New Weird novel to small-screen-feel alien movie. The term ‘New Weird’ became popular in the first few years of this century, but has not been universally accepted. Nor is it clear whether New Weird denotes a new genre, related to but distinct from the (Old) Weird, or simply the way in which new authors have breathed fresh life into the old genre. S.T. Joshi, the critical authority on the Weird, has little time for the term and refers to the ‘modern weird tale’ instead (publishing a book with that title in 2001). Joshi defines the Weird as a retrospective category of speculative fiction, published from 1880 to 1940, that is essentially philosophical in virtue of representing a fully-fledged and fleshed-out world view. He regards H.P. Lovecraft as the exemplar of the genre, which includes Arthur Machen, Edward Plunkett (Lord Dunsany), Algernon Blackwood, Ambrose Bierce and M.R. James. He also sees the tradition as having been continued through to the present by the likes of Robert Aickman, Shirley Jackson, Ramsey Campbell, T.E.D. Klein, Thomas Ligotti and Caitlín R. Kiernan. The New Weird was initially associated with China Miéville in the UK and subsequently Jeff VanderMeer in the US. Miéville’s first novel was King Rat, in 1998, and he began his Bas-Lag series with Perdido Street Station in 2000. VanderMeer was best known for his short stories and as an editor and anthologist, editing two definitive collections – The New Weird and Steampunk – with his wife Ann in 2008. He joined Miéville as the co-exemplar of the New Weird in 2014, when all three parts of the Southern Reach Trilogy were published: Annihilation, Authority and Acceptance. Miéville has his own characterisation of the Weird, set out in his essay ‘M.R. James and the Quantum Vampire’ (published in Collapse IV in 2008), that it is distinguished from the horror fiction derived from myth, legend, and folktales on the basis of the cephalopod natures of its monsters, which broke from previous tradition. As such, he includes H.G. Wells and William Hope Hodgson in the genre dominated by Lovecraft. There are several interesting elements to this approach, although it appears to ignore or at least regard as irrelevant the fact that the legendary kraken has been cast in a cephalopod image since at least the eighteenth century. VanderMeer acknowledges the importance of the tentacle and what it represents, but foregrounds the Weird’s pursuit of an abstruse and possibly even unattainable understanding of the supra-natural and the un-rational, i.e. as the expression of our dissatisfaction with and uncertainty about reality. For VanderMeer, weird tales also engage with the particular problems of peculiarly modern life and with the extremes of that life, a trend which increased as the century progressed. Miéville rejected ‘New Weird’ when it was applied to Perdido Street Station and it is difficult to reconcile his repeated emphasis on the urban – in works such as King Rat, Perdido Street Station, Iron Council, Un Lun Dun, The City & the City, and The Last Days of New Paris – with VanderMeer’s biophilia (from E.O. Wilson’s biophilia hypothesis), as suggested by reviewers’ descriptions of the Southern Reach trilogy as ‘Weird Ecology’ (Los Angeles Review of Books) and ‘Weird Thoreau’ (The New Yorker). VanderMeer defines the New Weird (or at least Miéville’s New Weird) as urban speculative fiction that is based on complex real-world models, employs elements of the surreal or transgressive, and is acutely aware of the politics of the modern world. His own New Weird is an ecological, environmental, or uncivilized (in Dark Mountain Project terminology) variant of the genre he describes. If there is a feature of the two authors’ oeuvres that connects Miéville’s city to VanderMeeer’s wilderness to the extent that it establishes a new type of Weird, then it is the self-conscious subversion of one of the central themes of Lovecraft’s fiction. Lovecraft had an aversion to the reproductive process, irrational fears about genetic inheritance, and a horror of miscegenation – the last either disclosed by the explicit racism of some of his stories or the implicit racism of his obsession with inter-species crossbreeding. Miéville and VanderMeer both explore the theme of crossbreeding without the racist overtones and with the implication that the contamination of humanity might be a source of empowerment or evolution and is thus neither necessarily terrifying nor necessarily dreadful. This new take on the Weird is an important part of what makes the Southern Reach trilogy original in its contribution to literature, relevant to life in the Anthropocene, and perhaps even visionary. Notwithstanding, I was a little underwhelmed when I read Annihilation, as the narrative failed to reach the potential promised by the premise of the novel. Part of my disappointment with the film is not so much that it has been dumbed-down or popularised, but that the adaptation process has opened a greater gap between narrative and premise, involving a dual failure to resist first the urge to explain and second, the urge to prioritise the human over the hybrid. Alex Garland’s adaptation is as classic a story as can be, a literal instantiation of John Yorke’s wonderful guide to storytelling, Into The Woods: the hero leaves home to go into the woods and comes back both changed and having changed something in the woods. Our hero, who is an unnamed biologist in the book but has become an ex-soldier-turned-academic named Lena (played by Natalie Portman) in the film, leaves the safety of the Southern Reach to go into Area X. Area X, AKA the Shimmer from the electromagnetic field that forms its boundary, is a remote part of the south coast of America where unexplained ecological changes have occurred following the impact of a meteor (providing an explanation that is deliberately withheld in the novel). The Southern Reach is the government agency that has been established to contain and explain the Shimmer, but the various expeditions sent into it have all resulted in disaster. The same is true of Lena’s journey into the swamp: the narrative structure is a-chronological and we quickly learn that she is the sole survivor of her team. Lena’s call to action – to use Yorke’s terminology – is the return of her husband, Kane (played by Oscar Isaac), a Special Forces soldier, from the previous expedition into the Shimmer. He arrives home nearly a year after entering Area X and many months after being declared missing-presumed-dead, walking into their house with an almost complete loss of memory and massive organ failure. Lena is recruited by Dr Ventress (played by Jennifer Jason Leigh), a senior official in the Southern Reach, and her readiness to volunteer for what appears to be a suicide mission is explained by her guilt at having had an affair with a colleague while Kane was missing-in-action. Lena joins Ventress and three other women, all of whom have suffered serious psychological trauma of some sort, on an expedition to reach the lighthouse on the coast of Area X.
Policing the End of the World. 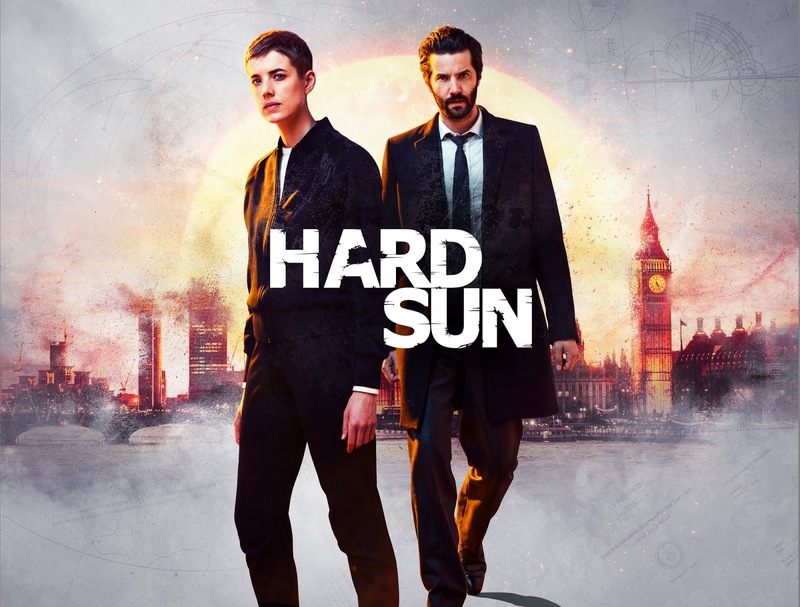 Hard Sun is written by Neil Cross, who is best known for his creation of Luther, the gritty British detective series that was first released in 2010 and is currently scheduled for a fifth season. (I should perhaps point out to readers outside the UK that many British series are in fact mini-series and the longest season of Luther was six episodes.) Cross’s television work includes episodes of Spooks and Dr Who, as well as the adaptation of the M.R. James short story, “‘Oh, Whistle, and I'll Come to You, My Lad’”, first published in 1904 and screened as Whistle and I’ll Come to You in the BBC’s A Ghost Story for Christmas series in 2010. He has also written for film and had one of his novels – Mr In-Between (1998) – released as a film in 2001. This film was both Paul Sarossy’s directorial debut and directorial swansong, but was in my opinion highly underrated (along with the novel) and was what first drew Cross to my attention. I mention Mr In-Between because it provided a clear but complex exploration of existential themes – abandonment, angst, authenticity, alienation, and absurdity – which return to take centre stage in Hard Sun. The first episode introduces the two protagonists, Detective Inspector Elaine Renko (played by Agyness Deyn, a highly successful model who has been acting since Clash of the Titans in 2010) and Detective Chief Inspector Charlie Hicks (played by Jim Sturgess, best known for his role in Cloud Atlas in 2012), both of London’s Metropolitan Police Service. Renko is a newcomer to Hicks’ major investigation team, taking over after his previous deputy’s murder. Their first case together is the suspicious suicide of a hacker, who appears to have gained access to GCHQ’s network (Government Communications Headquarters is the UK’s equivalent of the National Security Agency in the US). Renko and Hicks follow another hacker to a meeting with a media magnate and intervene when the sale of a flash drive turns violent. They arrest both men and are en route to the police station when all four of them are attacked by an MI5 death squad (MI5 is the UK’s Security Service). They escape and the premise for the rest of the series is set up when the flash drive is revealed to contain information about Hard Sun, an “extinction event” involving an explosion of or emission from the sun that is due to occur in five years. Renko’s response to acquiring the knowledge is to go public in order to guarantee her safety while Hicks opts to cooperate with Grace Morrigan (played by Nikki Amuka-Bird, a familiar face on the UK small screen, particularly for her part in Luther), the sinister MI5 intelligence officer who emerges as the narrative’s antagonist. The conflict between Renko and Hicks is exacerbated when the former is found to be investigating the latter, who is not only corrupt but suspected of having murdered his deputy, and when Morrigan attempts to manipulate the latter to kill the former. Both detectives are vulnerable in virtue of their families: Hicks has a pregnant wife and a step-daughter he wants to adopt and Renko was raped when she was fourteen and has a mentally ill teenage son who is in a (not-so-)secure unit after attempting to murder her. The Renko-Hicks-Morrigan triangle in the shadow of Hard Sun provides the backdrop for the rest of the series: the government and the media quickly represent Hard Sun as a conspiracy theory, along faked moon landings lines, and the plot involves Morrigan’s attempts to recover both the flash drive and a recorded video broadcast from Renko. At the thematic level, Renko, Hicks and Morrigan’s responses to Hard Sun are used to examine ethical questions about action and responsibility in the face of what existentialists would call the ultimate boundary situation – not just death in the face of contingency, but the death of the entire species (and consequently, for most philosophers within this tradition, the end of all values). Does the end of the world mean anything goes because nothing matters anymore? Or do our actions matter more because there is less time in which to undo harm or seek redemption? Each episode provides a case to solve within this context: a spree killer (episode 2), a lone wolf Hard Sun terrorist (episodes 3 and 4), a domestic murder (episode 5), and a serial abductor cultist (episode 6). There is a sense of absurdity in that Renko and Hicks are for the most part investigating crimes committed by “truthers” (people who believe in a conspiracy theory) whose views are actually true (because Hard Sun is real), but held for the wrong reasons (because they are obsessed or trying to justify their desire to harm others) – and that Renko and Hicks are two of a very small group of people who know that the truthers' claims are correct. Fantasy/eco-horror film revels in uncertainty. When Annihilation ended, the fellow next to me said, “I’m gonna need the CliffsNotes on this one.” I, too, was a bit confused by the film (directed by Alex Garland) and its message. However, further contemplation revealed that being comfortable with a lack of answers may just be the mindset the film advocates. Lena’s (Natalie Portman) husband Kane (Oscar Isaac) shows up confused a year after his covert Army mission to “The Shimmer”. Biology professor Lena then tags along with four other women – they all have a secret – who enter the no-man’s land within The Shimmer’s iridescent borders. She wants to find out what happened to her husband; her cohorts want to know why none of the previous explorers, excepting Kane, have returned. There are two theories regarding what happened to the men: they were killed by something within The Shimmer, or they killed each other. The film flashes backward and forward to scenes in Lena’s life as the group journeys through the lush tropical environment. Their goal (and the presumed source of the phenomenon) is a lighthouse. Annihilation examines the human tendency to mentally or physically “self-destruct”. It also takes to the extreme some of the new wave sentiments that posit man’s physical connection with the natural environment. One statement that comes up frequently in this film is, “I don’t know.” Thus, if you prefer a movie with a clear-cut explanation, then this is not the one for you. 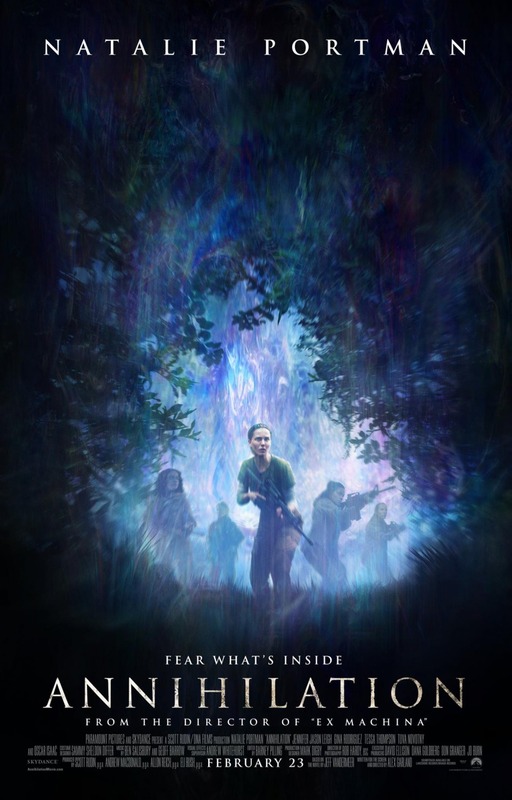 However, if you prefer films that challenge you to probe deeper into meaning and theme, Annihilation is a must-see. Another way to experience the film is to simply resign oneself to not knowing and indulge in its floral and faunal delights: kaleidoscopic fungal displays, crystal-like trees, deer with flowering wooden antlers, and more. Also watch for the prismatic light that occasionally pierces the mist-shrouded area. This light may reflect the discerning viewer’s experience of the film. Coogler’s third strike is as complex and compelling as his first two. I was worried about watching this film – almost as much as Blade Runner 2049 (reviewed for TQF here) albeit for entirely different reasons. I wanted to like Black Panther, but the odds seemed stacked against me. I wanted to like it because I admire Ryan Coogler for his artistic genius and for the way in which he has extended both black consciousness and consciousness of anti-black racism in his previous two films, Fruitvale Station (2013) and Creed (2015). Merely releasing a film with the title Black Panther, which recalls the Black Panther Party for Self-Defense of the 1960s and 1970s, in the era of Black Lives Matter, heightened racial tensions in the US, and Trump’s New Nationalism constitutes a political statement in itself. The Alt-Right countered with attempts to sabotage the success of the film via social media, but their efforts proved spectacularly unsuccessful when Black Panther broke several opening weekend box office records. I felt this took a little of the pressure off me because regardless of what I write now the film is already a commercial and critical achievement by Coogler. Why did I think the odds were stacked against me? Despite many attempts, I just can't get to grips with superheroes as protagonists, with superhero narratives, or with the superhero aesthetic in general. I can’t even manage a second viewing of The Dark Knight Trilogy, which is by one of my favourite directors. Black Panther is a Marvel Comics character, created by Stan Lee and Jack Kirby in 1966 (coincidentally, the same year in which the Black Panther Party was founded), and Black Panther is the eighteenth film set in the Marvel Cinematic Universe. The film is also the second of three in which Black Panther appears, after Captain America: Civil War (2016), and before Avengers: Infinity War, due later this year. I solved my ethical-aesthetic dilemma by approaching the work from the perspective of the Afrofuturist rather than the superhero genre. Alondra Nelson, a sociology professor at Columbia, characterises Afrofuturism as a movement that uses technical and creative innovation to make statements about black life and history with the aim of representing the Afrodiasporic experience in new ways. Popular examples include Octavia E. Butler’s Kindred (1979), Nnedi Okorafor’s Who Fears Death (2010), and N.K. Jemisin’s The Fifth Season (2015, the first book in her The Broken Earth series). Taking these three books as a guide, the following features of the genre are apparent: strong female leads, a deeply-embedded environmental ethic, the assertion of shared humanity through black experience, a seamless blend of tradition and modernity, and the reconciliation of the destructive and beneficial aspects of technology. With the exception of the first, these are all present in Black Panther. 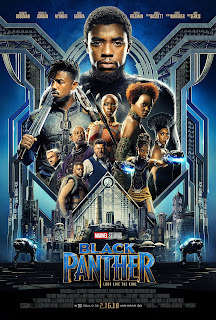 There are several strong female characters – most notably Nakia (played by Lupita Nyong’o) and Okoye (played by Danai Gurira) – but the lead roles are all male: Chadwick Boseman reprises his role as T’Challa, the Black Panther, from Captain America: Civil War, and fights first Ulysses Klaue (played by Andy Serkis) and then N’Jadaka (AKA Erik ‘Killmonger’ Stevens, played by Michael B. Jordan). The plot is very straightforward: T’Challa’s succession to the throne of Wakanda is usurped by N’Jadaka, his estranged cousin. In keeping with his previous films, however, Coogler exploits this simplicity as a means to the end of exploring extremely complicated themes. The first of these concerns the ethics of isolationism. Wakanda is a hyper-prosperous country in central Africa that makes use of its superior scientific development to hide its technology from the rest of the world, including its neighbours, many of whom are beset by political, criminal, and social turmoil. T’Challa’s father, T’Chaka, was opposed to any engagement with the rest of the world, but others – such as N’Jadaka and Nakia – believe that Wakanda should end its sequestration. For N’Jadaka, Wakanda’s duty is to lead a global African uprising that will turn the tables on the legacy of European colonialism and create a new world order where Africans (led by Wakanda of course) are masters and Europeans slaves. Nakia has a more benevolent goal, in which Wakanda takes a leading role in the UN and exports its science and technology to the world. T’Challa is torn between T’Chaka’s isolationism and Nakia’s internationalism, between tradition and modernity, respect for his father and admiration for his lover. The second theme is the appropriate response to colonialism and postcolonialism. T’Challa is opposed to reinforcing the oppressive hierarchy by simply inverting the power relation between white (Europe) and black (Africa) and aims to subvert the whole structure, to take the lead by example not force and to influence the rest of the world through existing international organisations. 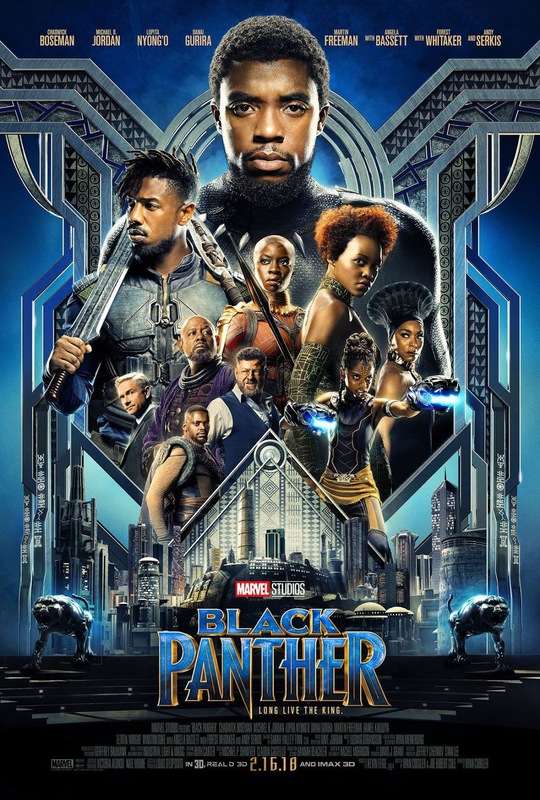 Coogler has already been criticised for the conservatism of his vision of black empowerment, but given the political context in which the film has been released (mentioned above) and the complexity and significance of the issue at stake, I think the critique fails to recognise the sophistication and nuance of his response. Part of the subtlety of Creed, for example, was the way in which Coogler was able to tell Adonis Creed’s story such that it showed what was missing in the representations of Rocky Balboa in the 1970s without undermining the importance of Balboa’s own story.